Analog Man presents the Boss BD-2/Super. The BD-2/Super can get a VERY pure clean boost sound after our mod, more transparent than a tube screamer due to less midrange boost, compression, and distortion. Visit our website for more info. Mid 2017 - These have gone to a cheap disposable surface mount circuit, which we can no longer modify :( Your best bet is getting a used one and sending it in for mods. The Boss BD-2 is quite an excellent pedal but has some drawbacks in it's stock form. Through a Fender amp with Fender guitars it is quite the icepick in the ear... and the TONE knob does not really roll off the high end. It is not a normal TONE circuit, even all the way down it is still quite bright. They do not have the mid-range vocal quality that a tube screamer has - which is a good thing to some people. The sound is less "effected" - more transparent than a tube screamer. I like the TS-808 sound a lot myself but I see where sometimes it is great to use a BD-2 instead. The BD-2 does not have the low-end loss that a tube screamer has so it stays nice and thick on the lows without getting flabby. My collaborator in Japan (Ohbayashi san), and I came up with this mod as we knew there was real promise in the BD-2 pedal. This BD-2 mod does not drastically change the circuit, but replaces many cheap, poor sounding components that Boss used. This is similar to what the high-end home audio guys routinely do when they buy a piece of equipment - they spend a few hundred dollars putting in the EXPENSIVE capacitors which lets the true sound come through. We are also changing circuit values in several places to make the tone control more useable and less shrill high end. I think the mod came out great but the caps are VERY expensive so the mod is best for professional guitarists or the type of people who go for the absolute best in their tone. You should use good patch cords like George L's or Lava (which we carry) to allow the full sound to come through. Ohbayashi san is sending me these high grade capacitors from Japan as they are not available in the USA. NOTE : The BD-2/SUPER can get squeal if you turn all 3 knobs up all the way. But our customers are normally not going for that loud, bright, and distorted of a tone so I have not heard any complaints yet. And the tone knob should never be run up that high with any decent amp. The difference in sound with our BD2 mod is easily heard at medium settings, and especially with your guitar volume rolled back a bit. There is not as much difference in sound when played through an already distorted amp. But if you crank the gain knob and turn down the TONE knob on the BD2, and play leads with the neck pickup, with the tone knob turned down on the guitar too, there is a huge difference. It changes a ratty sounding near-fuzz into a sweet woman tone, smooth and CREAMy. The BD-2/Super can get a VERY pure clean boost sound after our mod, more transparent than a tube screamer due to less midrange boost, compression, and distortion. We tuned this mod so that when you put the gain knob all the way down, and the volume and tone knobs at 12:00, you cannot tell if the pedal is on or off. Then you can just turn up the volume knob for your amount of CLEAN BOOST. On the other end, the BD-2/Super has more available distortion than a Tube screamer. It really has a wide range of excellent tones. If the gain knob is up, you can get cleaner sounds as you turn your guitar down, like our Sunface fuzz pedal. You can use the BD-2/Super along with the TS9/808/Silver for a great combination! I set them with the TS9 for rhythm and kick on the BD2 for leads or heavy rhythm. Both on together make my silverface Twin Reverb sound like a VOX AC-30 on 11! These setting are from 1-10, not o'clock settings. The BD-2/Super also works well with our Sunface pedal. Put the BD-2 after the sunface and it can thicken it up well if you are running into a clean amp. I really like the sound with the sunface with the volume knob backed down for a clean fuzz, then into the BD2 at a medium setting for a very dynamic crunchy sound. Wayne Krantz from NYC wrote me : I'm getting some nice play from the Blues Driver you modded for me - it could be the start of a new chapter...thank you. Several years later someone saw him still playing the same pedal at a show in Montreal so I guess it worked out!!! WOW!!! That BD-2/Super is something!!! It has such an incredible bottom end that is comparable to nothing I have ever used! I was impressed just utilizing that and bypassing the TS9/Silver altogether. I found that when I engaged both pedals I had to compensate for the increased noise collectively generated by notching back the gain by 2 and cutting some of the output level. I must say, I like the BD-2/Super better than the TS9/silver. While there is great application with the TS9/silver, and I will continue to use both, I found myself favoring the BD-2/super. It seems more consistent with my artistic flavors. I have been searching many years and have never, with the exception of the first time I played my SLO head through the Bogner 4x12, had a smile so "tantrically," out-of-body, engrossing that I had a lapse of my spatial relationship to the rest of the universe, and returned to one! The BD2/Super, through the clean channel (crunch toggle up) of my SLO, with the gain on 5 and volume on 6, persuaded that Bogner to transcend the now and returned me to that symbiotic comfort only found while swimming in the amniotic fluids. Ahhh, to be whole again. My BD-2/Super mod is the mainstay of my sound, the best o/d pedal I've ever bought! To me, its literally the best f***ing O/D available, BAR NONE! Between August 2010 & February 2011, I've been on a tone quest, purchasing some twelve Overdrive pedals, including three different Wamplers, two Landgraff's, a Zen, three Xotic's to mention but a few, and numerous others, all simply returned to sender! It's rendered all 5 of my Strats, (3 Fenders, 1 Anderson & an original Squier), the most healthy addiction a man could ever acquire! I got the (competitor) Mod BD/2 about 2 months before, and, well, let's just say, its been collecting dust ever since I took delivery of the BD-2/Super! Our Mod Form has a choice for the BD-2/Super mod for $65, please fill it out, print it out, and send it in with your pedal if you would like this mod. 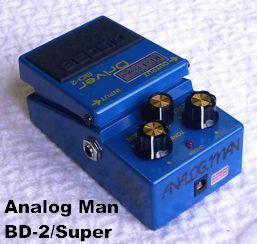 We also are selling New BD-2/Super pedals on buyanalogman.com. Here are some Japanese Reviews if you can read them! Be sure to check out the sound clips of the stock vs BD2/super in the Sound Samples area from The OD Pedal Comparinator. Besides great customer service and fast shipping, I am impressed as hell with the product. I had a competitor's mod and this one is much better and cheaper. Smooth as silk and nice and crunchy. Great as a first level OD, second level OD or lead pedal. Blows away the TS9. I have tried many pedals to get the absolute best boost without throwing various tonal elements out of balance. Boutique pedals and those with rave reviews in elitist publications on tone and mods included. All I will say is this pedal is the absolute, bottom line, best thing you could ever do for yourself. I read that Wayne Krantz used it and made things different for him. I had to hear for myself and am convinced there is nothing better in the known universe for me at this time. Mike, you have solved the boost/tone issue for me. I cannot ever thank you enough. Great pedal.......can be used in a couple of different ways: Use it as a very clear gain boost, gain almost all the way down, and level up. Or, you can get an almost Eric Johnson type lead (using a compressor as well) if you turn the gain up pretty high (turn the tone knob all the way down) Very nice pedal, glad I own it.